Drilling new wells is a highly specialised discipline requiring dedicated heavy equipment. But maintaining the pumps, piping and other accessories is in a skilled plumber’s wheelhouse. That’s not to say it’s easy. Even the simplest well systems can be very complicated and difficult to service. A savvy plumber is required to troubleshoot the many issues that can pop up. 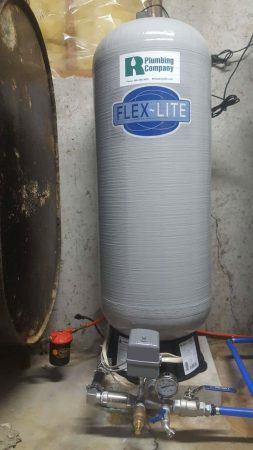 A well system will typically have a storage tank inside the home that provides a steady supply of water for peak demand hours without over stressing the well. A control system is then required to keep the tank level up and regulate the pressure. Quite often a water treatment system is added to improve the quality of the water, adding to the complexity. These systems, complex as they may be, are well within our expertise level. R plumbing can make your ailing well better. The term water treatment covers just about anything that’s done to improve the quality of your domestic water. Our local water authorities do a pretty good job of treating town and city water to make it safe and useful. (how good it tastes is a matter of, er….taste.) Some feel that their city water could use some further treatment, usually filtering. More typically it’s well water that needs treatment. This treatment takes many forms, but the most common issue is “hardness” or excessive mineral content. Excessive hardness can render just about any soap or detergent nearly useless and can lead to staining of sinks, faucets and toilets, especially with high levels of iron (very common in Connecticut). Other issues can include stinky H2S2 and even dangerous Radon or arsenic. Commonly a given well’s water will have more than one issue which can require different (and even competing) treatment methods. This needs careful balancing and a fair bit of compromise (the good kind) to get the best outcome. 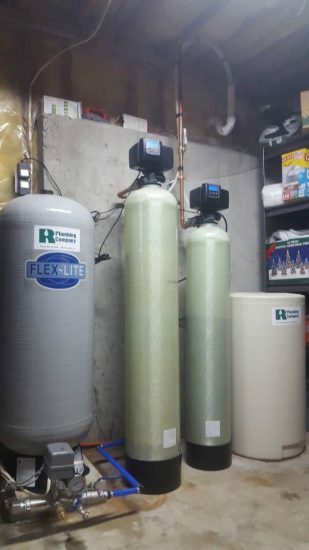 We work with our partners at Blake Group to design, source, and implement a water treatment system specifically to meet your needs.